Are you confused about which phone to choose from between Samsung Galaxy s7 and iPhone 7 when both of them have equally fabulous features? After both the giant tech companies announced their upcoming launches, the world has been waiting to delve into their features. This review compares the display, camera, configuration, connectivity options and storage space of both the phones. Samsung Galaxy s7 has a display screen of 5.5inches with super AMOLED 2560 x 1440 pixels resolution which lets you view minute details with good clarity. iPhone7 has a display screen of 4.7inches and a 5.5inch 3D touch. It has 1334 x 750 and 1920 x 1080 pixels resolution which is lesser than that of Samsung Galaxy s7. Nevertheless, iPhone 7 doesn’t fail to impress the world with its features. Do they have an ideal configuration? Samsung Galaxy s7 has a storage unit of 32/64GB with a microSD slot that can be used to expand the memory. It is powered by Snapdragon 820 and has a 4GB RAM. It has a strong configuration. This phone is water and dust proof up to 1.5m depth for 30 minutes. iPhone 7 has internal memory of 32GB, 128 GB and 256GB with no microSD slot. Its CPU is A10 Fusion processor with 3GB RAM which is lesser than that of Samsung Galaxy s7. This phone is water proof and dust proof as well and comes in discounted price when purchased using the Paytm cashback offers. Samsung Galaxy s7 comes with a 12MP rear camera with features of telephoto and wide-angle, optical image stabilization, 4K video recording, 6-element lens, quad-LED flash with flicker sensor. Its front camera is of 7MP which has wide angle lens. iPhone 7 stands at the same place with Samsung s7 in terms of camera. 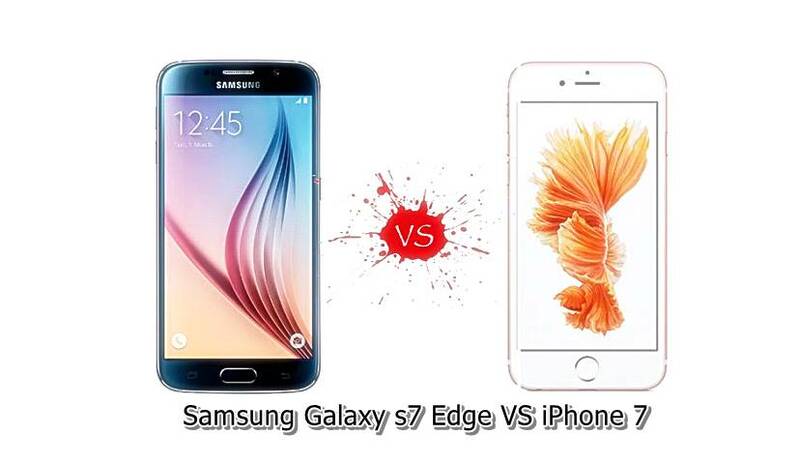 Its aperture, f/1.8 is higher than Samsung s7 which is f/1.7. It has new image signal processor, quad-LED flash with flicker light. Do they have enough storage space? Samsung Galaxy s7 has a good memory of 32/64 GB of internal memory and offers a RAM of 4GB. Apart from that, its memory can be expanded using a microSD card which is quite impressive as the user can store a huge volume of data in it. iPhone 7 has great internal memory options of 32GB, 62GB and 256GB. Although, it does not have a slot for microSD, it has quite an impressive internal memory. Samsung Galaxy s7 uses a non-removable battery of 3000 mAh which is an improvement from its earlier version which was a mere 2550 mAh battery power. iPhone 7 uses a capacitive home key along with a Haptic engine with 2900 mAh. As per the claims by Apple, this version has a battery life better than its previous version by two hours. Samsung Galaxy s7 and iPhone 7 has Bluetooth 4.2, mobile hotspot and Wi-Fi connectivity. Both support turn-by-turn navigation ad voice navigation. Samsung Galaxy s7 comes with a microUSB and iPhone s7 has a proprietary connector as additional feature. Samsung Galaxy s7 has taken a big step forward with its flashy features and strong configuration. iPhone 7 is also on the run with its improved features and amazing configuration. Both the phones’ battery lives have been improved with better camera and resolution. So, when buying one for yourself, just check out an compare the pros and cons of both the phones and settle down for one.